The NASA Hubble Space Telescope photo of V838 Monocerotis (above) was breathtaking to behold in the New York Times (March 9, 2004). This photo reminded me of the Ouroboros the serpent or dragon swallowing its own tail. I've scanned a drawing of the Ouroboros from an alchemical text (right) so these two images may be compared and studied side by side. In Coptic, Ouro means king, and in Hebrew ob means a snake. 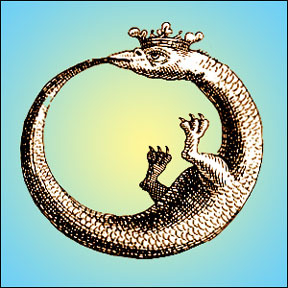 My first encounter with the Ouroboros was reading about Kekule's discovery of benzene after he had dreamt of a snake biting its own tail. Here are two references on V838 Moncerotis (below) and two sources on Ouroboros from my library (right) as well as web links. 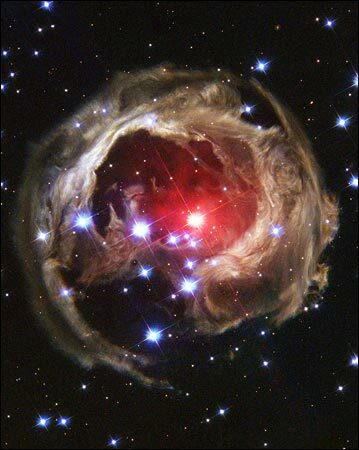 Two years ago [ Jan. 6, 2002], a distant star with the prosaic name V838 Monocerotis flared like a flashbulb to become the brightest star in the Milky Way before fading into obscurity again. Astronomers do not know what caused the eruption, but a new image from the Hubble Space Telescope has revealed that it was not unique. The picture shows concentric shells of dust thrown off by previous explosions winding around the star like layers of a fragile cocoon. The dust shells are illuminated by the flash of the recent flare-up as it sweeps out at the speed of light. Dr. Sumner Starrfield of Arizona State University and Dr. Howard E. Bond of the Space Telescope Science Institute say they have counted at least 11 concentric rings, suggesting a series of outbursts over the eons.